As a healthy, happy, thirty-nine year old mother with no family history of breast cancer, being diagnosed with the disease in 2010 shattered my world. As a nurse, social worker and child development specialist with experience in an intensive care unit and both adult and pediatric hospice, I found myself in the unique position of moving from the side of the bed as a healthcare professional into the hospital bed as a patient. I had been trained to heal. When I became a patient, the healing process became very personal. Shortly after my diagnosis, I looked for a guide and companion in the form of a book that would support and inform me, my family and friends throughout the cancer experience. I was looking for something that was simultaneously informative and hopeful, realistic and supportive, clinically credible and visually beautiful. That book simply did not exist, so I created it along with my dear friend and award-winning photographer, Elizabeth Messina. 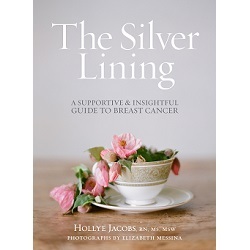 The Silver Lining is my intimate experience with breast cancer written through the lens of my professional, clinical experiences in health care. Each chapter is divided into two sections. The first half is my story with Lifelines inserted throughout. These lifelines are the things that I wish I had known or hints for what helped me. The second half of each chapter is called “Practical Matters” because when you have breast cancer, the practical really does matter. In this section I offer practical, accessible and relatable lists of everything that a person needs to know to get through the experience, including what to pack to take to the hospital, how to talk with children, how to get more sleep and reduce stress and how to be a friend to someone who has cancer, to name a few. I’m especially grateful to Breastcancer.org for their generous willingness to contribute to this part of the book! Looking for and finding Silver Linings were essential to my well-being during treatment. They buoyed me and kept my spirits hopeful from the time of my diagnosis throughout my double mastectomy, chemotherapy, radiation and recovery. Silver Linings gave me the balance and perspective to get me through the darkest of days. The thing about Silver Linings is that they don’t take away things like nausea, constipation or anxiety that can come with a cancer diagnosis, but they do provide a glimmer of hope to get you to the next moment. What I know for sure about Silver Linings is that they are always there. All one has to do is look for them. The ultimate Silver Lining of my breast cancer diagnosis, treatment and recovery is to try to make it better for those who have to follow me down this difficult path. This is why I am sharing my story. I am the experienced girlfriend who wants to help shed some light on the darkness, bring order to the chaos and hold your hand throughout your experience. Editor’s Note: Purchase The Silver Lining. Well done for writing an informative AND beautiful book.